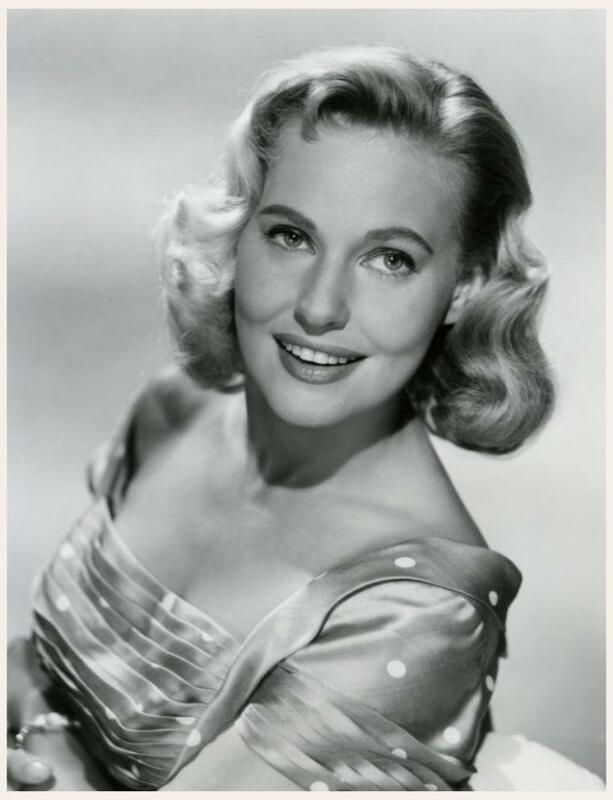 ...Lovely and talented Lola Albright turns 90 on Monday, July 20th. Albright was born in Akron, Ohio, in 1925. 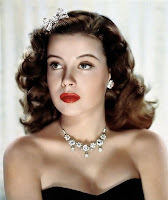 Her film career began in the chorus of MGM musicals such as THE PIRATE (1948) and EASTER PARADE (1948), and she quickly moved up to leading roles in films such as THE GOOD HUMOR MAN (1950) and WHEN YOU'RE SMILING (1950). She did a great deal of TV work, most notably PETER GUNN. Albright films previously reviewed here include THE KILLER THAT STALKED NEW YORK (1950), THE SILVER WHIP (1953), TREASURE OF RUBY HILLS (1955), and THE TENDER TRAP (1955). ...The wonderful Gloria DeHaven, a Los Angeles native, turns 90 on Thursday, July 23rd. DeHaven sparkled in many MGM musicals including TWO GIRLS AND A SAILOR (1944), SUMMER HOLIDAY (1948), SUMMER STOCK (1950), and THREE LITTLE WORDS (1950), as well as the delightful Fox musical I'LL GET BY (1951). DeHaven films reviewed here include SUSAN AND GOD (1940), SCENE OF THE CRIME (1949), THE DOCTOR AND THE GIRL (1949), and DOWN AMONG THE SHELTERING PALMS (1953). DeHaven's first husband was John Payne, with whom she had two children. ...Speaking of John Payne, over at Riding the High Country Colin has reviewed the enjoyable RAILS INTO LARAMIE (1954), costarring Dan Duryea and Mari Blanchard. 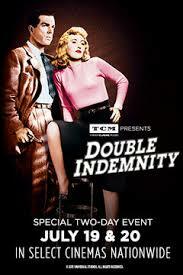 ...TCM presents DOUBLE INDEMNITY (1944) nationwide on July 19th and 20th. Check online for the closest theaters and times. ...Congrats to our friend Bob Joles who was one of two winners in TCM's "Noir Summer" Twitter script contest. Bob's entry: "As I listened to the monotonous staccato of rain on my window, she walked in. An hourglass figure with time on her side." ...TCM has also announced the guests for this November's TCM Cruise aboard the Disney Magic. The list includes, in part, Leslie Caron, Eva Marie Saint, Ruta Lee, Louis Gossett Jr., Roger Corman, Eddie Muller, Illeana Douglas, Kate MacMurray, and Alex Trebek. 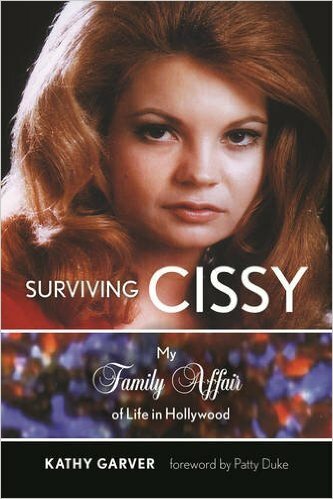 ...Kathy Garver of the TV series A FAMILY AFFAIR has a book coming out in a few weeks, SURVIVING CISSY: MY FAMILY AFFAIR OF LIFE IN HOLLYWOOD. Rick has a very nice interview with Kathy at the Classic Film and TV Cafe. 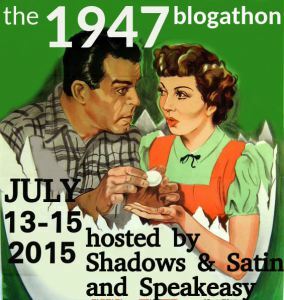 ...At her blog Out of the Past, Raquel has a set of fun posts on her classic film memorabilia. Visit Part 1 and Part 2. 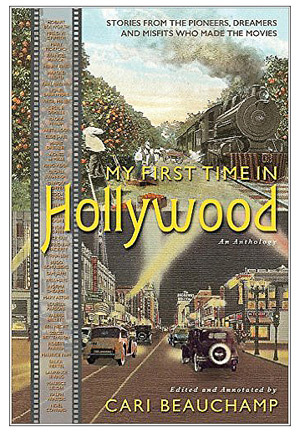 ...Leonard Maltin reviews three "new and notable" film books, including BEHIND THE SCENES OF THEY WERE EXPENDABLE: A PICTORIAL HISTORY which will be reviewed here in the near future. ...Leonard also has a very interesting review of MAN OF CONQUEST (1939), which stars Richard Dix, Gail Patrick, and Joan Fontaine. It was just released on DVD by Olive Films. ...The final Maltin link for this week: Leonard is very enthused indeed about the newly released Marvel/Disney film ANT-MAN (2015). As someone who's just started to check out these movies, I may have to try it. Look for my review of CAPTAIN AMERICA: THE WINTER SOLDIER (2014) in the next few days. ...At I See a Dark Theater, Kim looks back at the 2014 screening of the restored RAMONA (1928) at UCLA. That's something I would have really enjoyed seeing! Dolores Del Rio and Warner Baxter starred. 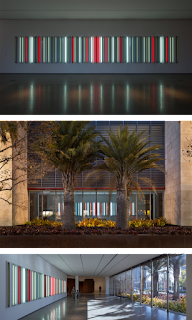 ...I'm rather taken with Miracle Mile, glowing art seen at the right which will be on exhibit at the Los Angeles County Museum of Art the first week of September. ...Home Media Magazine presents a report on a Comic Con panel on the future of physical media, moderated by Bill Hunt of The Digital Bits. As a film collector who's only dabbled in Blu-ray occasionally, comments like this caught my interest: "DVD got really successful, far more successful than anybody knew it would be. It turned people from collectors to consumers. They bought stuff just to buy stuff and that boosted all the sales numbers. Then you go to Blu-ray which became much more collector driven, so the people who didn’t want to buy every single title weren’t buying every single title, so the studios looked at that as not as successful, when the reality is it’s as successful as Laserdisc was 20 years ago, even more so." Also: "Blu-ray should never have been marketed as a mass product. It should have been more of a collector format that could support the numbers that it would ultimately do because as all of us can attest, we would pay." 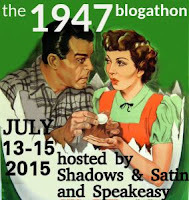 ...Kristina has all the links for last week's 1947 blogathon at Speakeasy. Lots of great posts! ...If you missed last week's link roundup, it can be found here! ...I also recently posted a big roundup of news on Disney movies, books, theme parks, and the upcoming D23 Expo. Loved Lola Albright in PETER GUNN, and I have a CD of one of her albums. Great style. Laura, I agree wholeheartedly with the producers (or whatever they were) of Blu-ray discs and their comments at the Comic-Con. So far, Blu-ray is a "niche" market (you have to upgrade just about everything; all your hardware, etc. But the price of doing so has been steadily dropping over the past several years; you can get a Blu-ray player at Costco or Wal-Mart for about 80 bucks now. )but for film collectors and even just film enthusiasts, Blu-ray is the only way to go. The picture and especially the sound can be absolutely incredible. For example, compare the old Fox DVD of "Journey To The Center Of The Earth" with the newest Blu-ray release of the same title by "Twilight Time" and the difference is staggering. The older Disney films (and I know you are a Disney fanatic) look unbelievable. "Fantasia" and "The Adventures Of Ichabod And Mr. Toad" didn't look (or sound) this good even on their initial releases. I am particularly looking forward to a Blu-ray release of "20,000 Leagues Under The Sea".....whenever that occurs. I have bought MANY titles on Blu-ray that I already had on DVD just because the difference is so great that I couldn't not do it! Brad, great to hear from you! Although I definitely enjoy Blu-ray more since we got an HD TV, I can't say I'm a big convert. Many of our Blu-rays came as part of Blu-ray/DVD packs. I've upgraded a few favorite films to Blu-ray -- just got ALICE IN WONDERLAND as it was very inexpensive and had extras I couldn't get on DVD. I also worry about buying a bad Blu-ray -- I remember reading some bad reviews of how MEET ME IN ST. LOUIS looked. On the other hand I must say the Blu-ray of EXPERIMENT IN TERROR was one of the best-looking home viewing experiences I've had, and ICAHBOD (which I got in the Blu-ray/DVD combo set) looked great. I also prefer the versatility of DVDs, which can be played on laptops when my husband travels on business, on the player in the van (not that it's used much anymore, with our kids all getting older! ), and lent to family and friends who don't have Blu-ray players. And of course they cost less...I just ordered some Criterions and although we have two Blu-ray players now I ordered DVDs rather than Blu-rays, which is typical for me. Anyway, I'm glad you shared your good experiences with Blu-rays, you sound like a satisfied customer! Good to have feedback on this issue. I'd be interested to know how other classic film fans feel about the format. I've not gone the Blu-Ray route at all, Laura, for some of the same reasons as you but mainly because I don't want to be continually repeating films every time they arrive in a new format. I have other spending priorities for one thing and, like you, find that DVDs are generally fine quality.